Innovative Desktop Toy for the Office, or Cool Gadget or a kid's bedroom! Easy to care for - Ants need NO food or water. 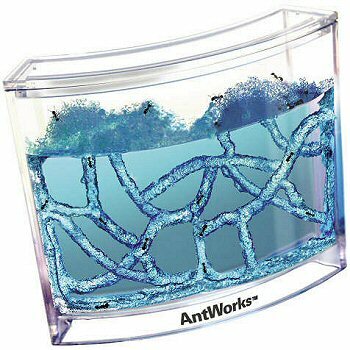 The Ant Works is filled with a highly nutritious non-toxic gel into which you make four small holes to get the tunnel network started. 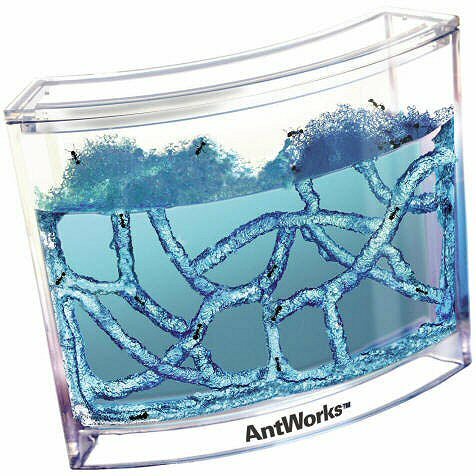 Now add your ants into the Ant Works, replace the lid and watch. Within days the ants will burrow out an amazing pattern of channels, each clearly visible in cross-section through the walls of the container. Maintenance is minimal. Besides providing a safe ecologically-correct habitat, the gel also provides the ants' food. You simply need to open the lid for a moment once a month to aerate the interior. Easy to care for, once inside the AntWorks the ants require NO aditional food or water. Simply insert ants into the clear nutrient gel, secure the lid and let the 3-D tunneling show begin! Either collect your own ants or order via mail (ordering details included in packaging).